Although few people are aware, pillows have expiration dates that should be observed, just like any other object in the bedroom. The amount of daily contamination to which we submit our pillows is massive. Pillows are one of the favorite hiding places for microorganisms that feed on the natural secretions we eliminate during sleep (sweat, saliva, tears, earwax, nose secretions and even dead skin). Not to mention the artificial products, such as cosmetics, perfumes, dies and make up. Beds, mattresses, and pillows maintain microclimates in which the degree of heat and humidity promotes the emergence of mites, together with fungi and bacteria, which can cause conjunctivitis, eczema, sneezing, itching on hands or face, runny or stuffy nose, or even asthma, especially in the case of allergic people. Just to give an idea, after about six months of use, a pillow may contain around 300 thousand mites and, after two years up to 25% of its weight may be composed of mites and its wastes. Even in pillows with anti-mite treatment there is accumulation of the wastes mentioned above, which would decrease the antimicrobial efficiency. That’s why specialists recommend that a pillow should be replaced every two years. This time period, however, may be subject to forgetfulness. Therefore, thinking on the consumers' health and wellbeing, Duoflex innovates on Costumer Service by offering an app that will remind you of the exact moment the pillow should be replaced! 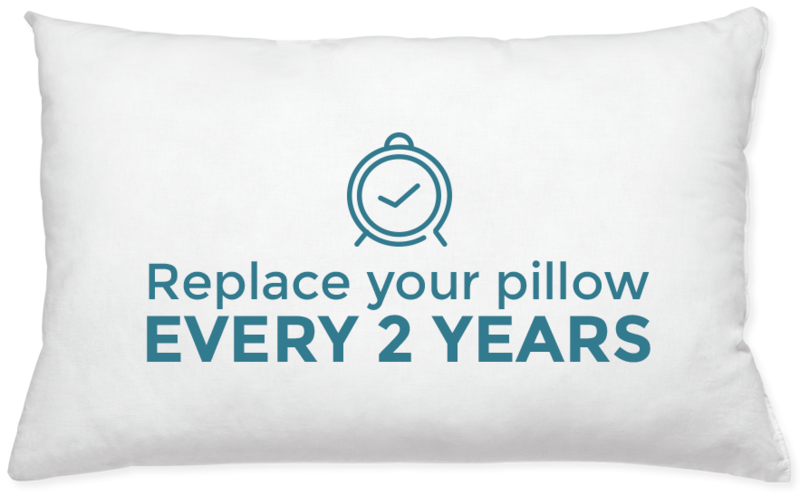 After the purchase, you just fill the form below and, when you complete two years of use, we will send a message to your email informing you of the time to replace your pillow. This procedure, more than being simple, contributes to your health and sleeping quality maintenance!